OR THAT TEST AT MINIMUM VALUE FOR A "GOOD" TUBE. IT MAY BE RETURNED WITHIN 90 DAYS. Not the reissue Tung Sol tubes made in Russia. TELEFUNKEN used/tested 12AX7/ECC 83 Smoothplates. rich and detailed sounding tube. Great for audio gear and guitar amps. These tubes were tested in a Fender Deluxe Reverb for noise. 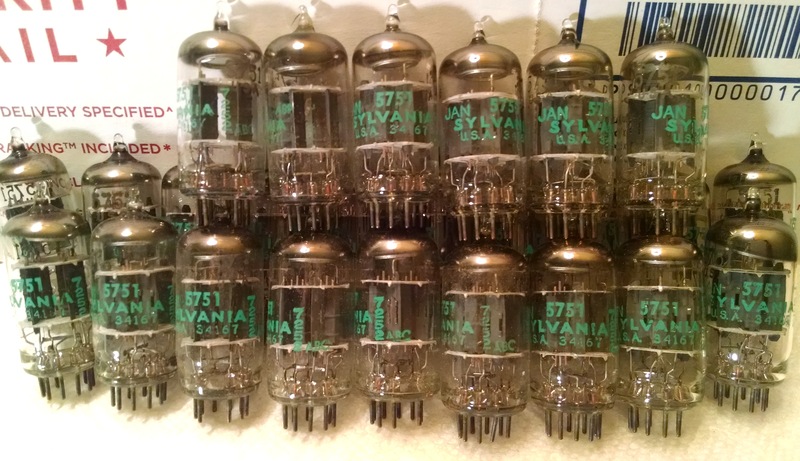 great and different sounding vintage tubes at a reasonable price. The easiest way to mod your amp is to try a different preamp tube. All ANOS tubes test new or close to new. the new tubes on the market nowadays. NOS ORIGINAL BOXES ... $60 each. OUT OF STOCK. A deep and three dimensional sound-stage. These were found bulk packed not in commercial boxes. 20 in stock shipped in white boxes. 12AU7/ECC82 TELEFUNKEN USED/TESTED RIB PLATE. These are getting to be VERY hard to find ! Three in stock $20 each. 3 pairs with matching date & production codes. Two in stock one is labeled RCA. These are boxed and labeled Mullard and Sylvania - made in Holland.